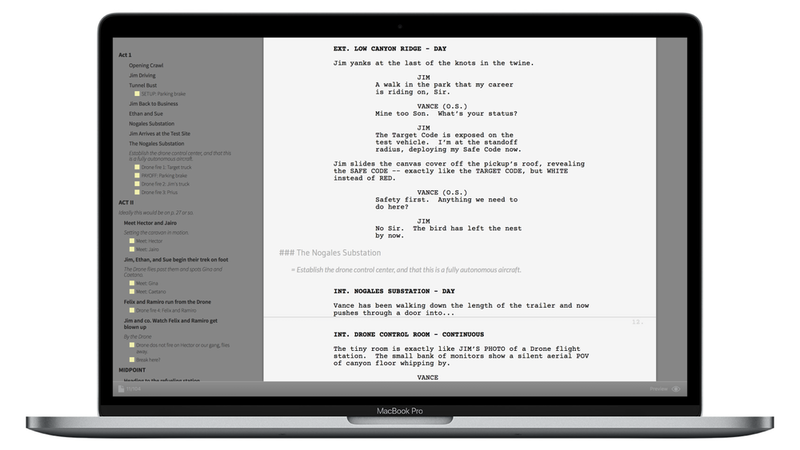 Slugline is a simple, elegant app for the most important part of screenwriting: the writing part. The Mac App Store’s best-reviewed screenwriting app doesn't have any buttons, rulers, talking paper clips, or simulated cork boards. Slugline gets out of your way and lets you write. Formatting? Automatic. Outlining? Integrated right into your writing. Bells and whistles? Get back to work. 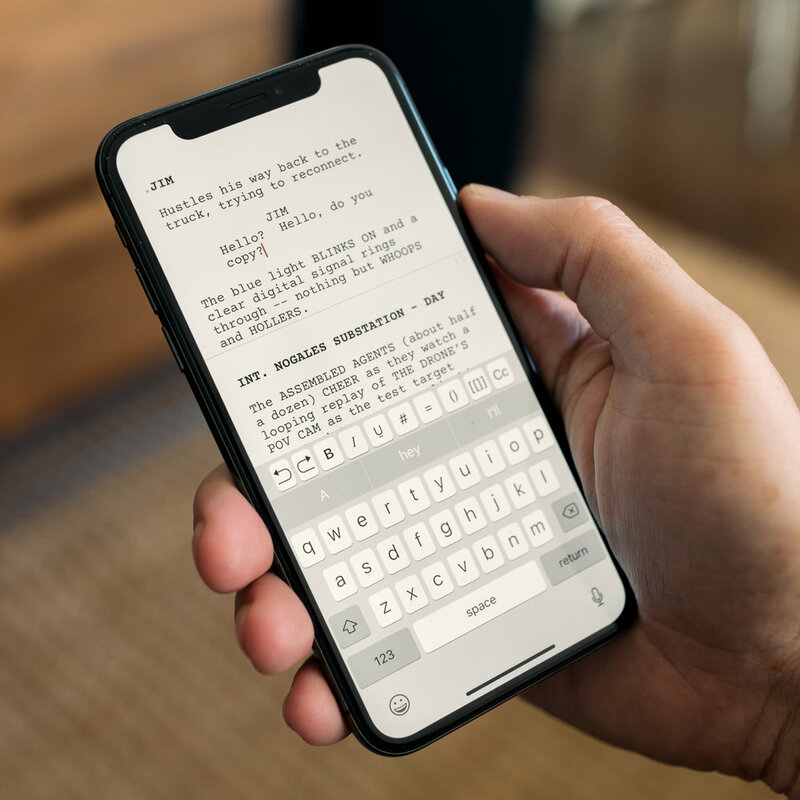 Write and edit your screenplay on your iPhone. Turn your iPad into a distraction-free mobile writer’s room. Slugline for iOS is fully compatible with Mac, sharing files on iCloud and Dropbox. But it also works on its own, creating perfect Hollywood-standard PDF output. From your telephone. Slugline's Outline navigator updates live, as you write. Start with a rough sketch of your story and then fill in the details, or just start writing, and decide later if you want to add navigation points. You choose what shows up, and how you use it. Navigation? Scaffolding? To-do list? Your Outline is just for you, and disappears when you print — unless you don't want it to. Slugline for iOS features the same automatic formatting and integrated outlining as the Mac version. It even exports perfect PDFs. It could well be the only screenwriting app you need, but of course it syncs with the Mac version, via iCloud and Dropbox. Slugline for iOS has a dark mode, so I can so I can watch you weave then breathe these story lines. The Mac Tab key is your shortcut to frequently-typed elements, including an automatically-updated list of every speaking part in your movie. Slugline for iOS syncs with iCloud and Dropbox. It automatically keeps a local copy of your work too, so if your connection drops out, your writing is safe. Thinking of cutting a word, a line, or an entire scene? Instead of deleting it, omit it. When you Preview or Print, it disappears. Slugline supports drag and drop on iPad, and is optimized for maximum legibility on every size of iPhone. Notchurally. Style your screenplay to taste, while adhering to Hollywood standards. You can even use the lovely Courier Prime typeface, designed specifically for screenwriting. Slugline comes with several useful templates, including the famous Blake Snyder Beat Sheet® from Save the Cat. Hollywood star? We have five. Slugline is the highest-rated screenwriting app in the Mac app store, with a lifelong five-star average rating. People love it, and you will too. Pair a hardware keyboard with Slugline for iOS and use your familiar keyboard shortcuts from the Mac version.